Just south of Indianapolis, Johnson County's proximity to the big city helps make it a good place for middle class folks. But that's not its only advantage. What's the area's secret sauce? For starters, the county's varied mix of industries supports a diverse local economy. Greenwood, the closest town to Indianapolis, is a retail and dining center for the south central part of the state. It's also a bedroom community for commuters. Further south, Franklin has a solid manufacturing base -- including many auto related plants -- while continuing to support an agricultural sector from its days as a farming town. But it's not just about good jobs and decent incomes. Franklin also has generous public sector support for things like schools and infrastructure as well as relatively low taxes, said Tricia Bechman, head of the local Chamber of Commerce. CNNMoney also considered things like education levels, income inequality, housing affordability, crime and poverty rates, and access to amenities such as banks, health care and grocery stores. 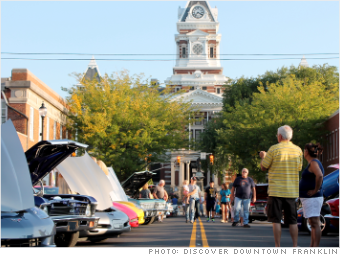 Here are seven more places that score high on middle-class life -- and how they pull it off.